When Italian Job screenwriter Troy Kennedy Martin began putting his thoughts on paper for the anti-Thatcher and Reagan age nuclear cautionary political miniseries Edge of Darkness, he assumed he was just getting it out of his system since he couldn't fathom that the BBC would ever air what he was writing in a million years. Yet not only did his home station air the incredibly gritty, dark, and cinematic work in 1985 but the originally six episode run earned the broadcast equivalent of BAFTA honors by garnering the BBC a half dozen statues for this bleak mystery. Now a modern BBC classic, Edge changed the landscape of British television forever by putting an end to the stationary camera set-ups of simply recording drawing room style dialogue but instead ushering in a new area of works that were-- as in the case of Traffik-- more ambitious than some of the feature films of this era. Forcing its audience to change the way they considered television as silly and escapist or simply there to bring posh costume dramas into their living rooms, Edge of Darkness as conceived by Troy Kennedy Martin and filmmaker Martin Campbell who directed the feature film remake with Mel Gibson went beyond the "ripped from the headlines" police procedural efforts of that decade through today. The demand four our intellectual involvement was achieved by presenting us with a stark look at where we were headed in terms of nuclear weaponry, the planet, and ourselves as a human race. It's an intriguing film to watch so many years later, as this was a "green agenda" miniseries before its time as its main character, Officer Ronald Craven (a tremendous Bob Peck) was originally supposed to literally turn into a tree in the final moments, which was thankfully scrapped somewhere in the process. Although as an all-around work, I still believe that Traffik was the more urgent, ageless, and still incredibly powerful miniseries. For despite its brilliance, Edge of Darkness suffers from an off-putting air concerning our main character's vaguely incestuous relationship with his deceased daughter (Joanne Whalley). And while this is indeed troubling, there are also a few gaps in logic and plot structure when it continues, including never allowing us to fully understand what led to the fatal incident near the film's beginning when bright college student Emma takes two barrels to the chest from a maniac with a shotgun who yelled her last name. Assuming the bullets were intended for her father Ronald Craven and that Emma-- having long taken over some of the protective duties of wife and mother since the death of her own-- Craven blames himself for her brave and fierce determination to block the blasts with her own body. A politically active environmentalist who works with a group that others label communist, dangerous and even terrorist-like, after Craven finds a Geiger counter that reveals a lot of radioactive particles in a clipped section of his daughter's hair along with a hidden handgun he didn't know about, he sets out to discover not only what happened but-- as we suspect-- get revenge at any cost. Undoubtedly for the show's humorous relief, Bob Peck's Ronald Craven forges an unlikely alliance with a loud American CIA agent (a wonderful Joe Don Baker) who loves golf and British ballroom dancing television shows. Yet, Troy Kennedy Martin provides another odd sidekick for our lonely lead by bringing Emma back to life either as a ghost or a figment of his imagination as Whalley and her father chat back and forth during his quest, which both helps and hinders the paranoid political thriller. It's an obvious artistic backlash against what the scribe dubbed "Thatcher's England" and Ronald Reagan's Presidency that many believed were far more reactionary and damaging than the "compassionate conservatism" we were supposed to believe. 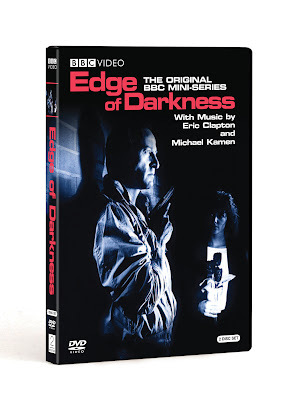 And while Edge of Darkness does tend towards speech-making from time-to-time and the final episode drops the fast pace of those that preceded it with some dubious plot twists, it's rare to see something so connected in all departments to a level of confidence in presentation that you just don't see much on television even today. Moreover, nothing about Edge of Darkness feels rushed to make it the TV Movie of the Week we often find in most work as Peck gives the performance of his career right alongside Joe Don Baker. Likewise, under the steady guidance of Goldeneye, Casino Royale, and The Mask of Zorro director Martin Campbell, we sense we as an audience are in good hands as soon as it begins. Luckily he doesn't disappoint as in this series, he proves he's just as adept at action direction as he is with ensuring we have a strong emotional connection to our leads and empathize with their plight, even though we're not quite sure we genuinely understand their complicated personalities. For, while James Bond is enigmatic in his own right, he's got nothing on the agony and mystery of Ronald Craven as witnessed in this 2-disc set. Likewise in the series, the special features and even the menu, the mood of Craven is especially tangible when the wailing bluesy guitar of Eric Clapton and his fellow composer Michael Kamen. The unforgettable "Edge of Darkness Theme" speaks volumes about the guilt about Craven's past, what's haunting him in the present and his most likely desperate future in a way that transcends the few words our lead says. Overall, it's very Edgy and not quite the cut-and-dried detective stories we're used to finding on the BBC or ITV these days. Edge of Darkness, which I received from Warner Brothers on behalf of BBC is a disturbing, engrossing and unforgettable cautionary tale well-worth your while to see before you think of exploring the truncated feature film version made twenty-five years later by Campbell again.